Having discovered at the last minute that our local Council were planning £68 million worth of cuts to services, the Hammersmith & Fulham Coalition Against Community Care Cuts (HAFCACC) decided we needed to be at the meeting. 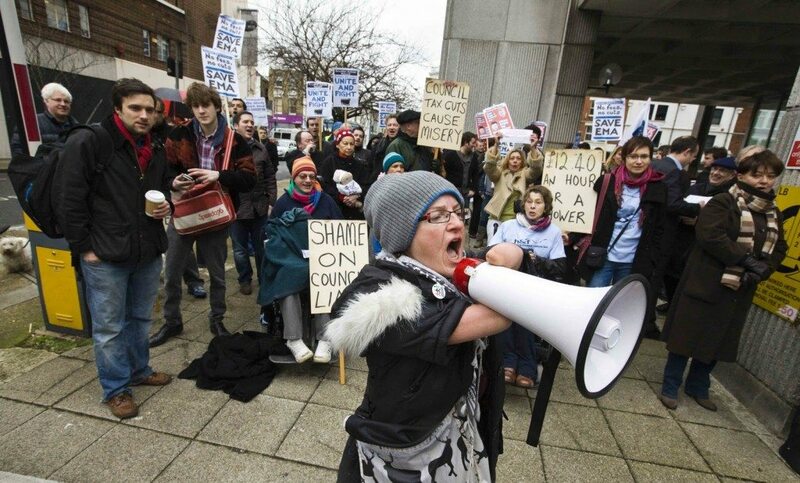 In our short history we have a great track record on local action – lots of crips on the streets protesting and a couple of years ago we took the council to judicial review to stop the introduction of home care charging – sadly the case wasn’t successful but we made things very difficult for the local tories as we have done since. We all know times are tough but it was clear from the laughter coming from Tory councillors that they had absolutely no concept of the damage the cuts would do to disabled people’s lives or any interest in what we had to say about it. In fact they were constantly distracted by their mobile phones. The meeting was a disgrace and made a complete sham of local democracy – no wonder then that we made our anger, frustration and disgust known throughout the meeting – loud and often. “Tory Scrum” is a particular favourite of mine! It was obvious that Tory councillors were uncomfortable having disabled people there telling them the truth. So before too long me and my partner, Andy were evicted by three ‘heavies’ – I didn’t leave before l told the assembled Tories exactly what I thought of them!! The following day we heard that the Tory annual conference was being held at Hammersmith & Fulham Town Hall the next Saturday and the word was that Boris Johnson was planning to use the event to launch his mayoral campaign – a perfect opportunity to turn up on mass. Boris did show up but was hurried through a side entrance so he didn’t have to see our protest – so much for his desperate need to be loved by Londoners – it seems this only applies to Tory voting Londoners. HAFCACC’s protesting against these cuts continues and we are busy hooking up with other local campaigning groups to strengthen our voices. I’ve got to tell you – there is something so bloody empowering about telling the truth to power – long will it continue! !